Infrastructure support for ASCO study administration and site participation. 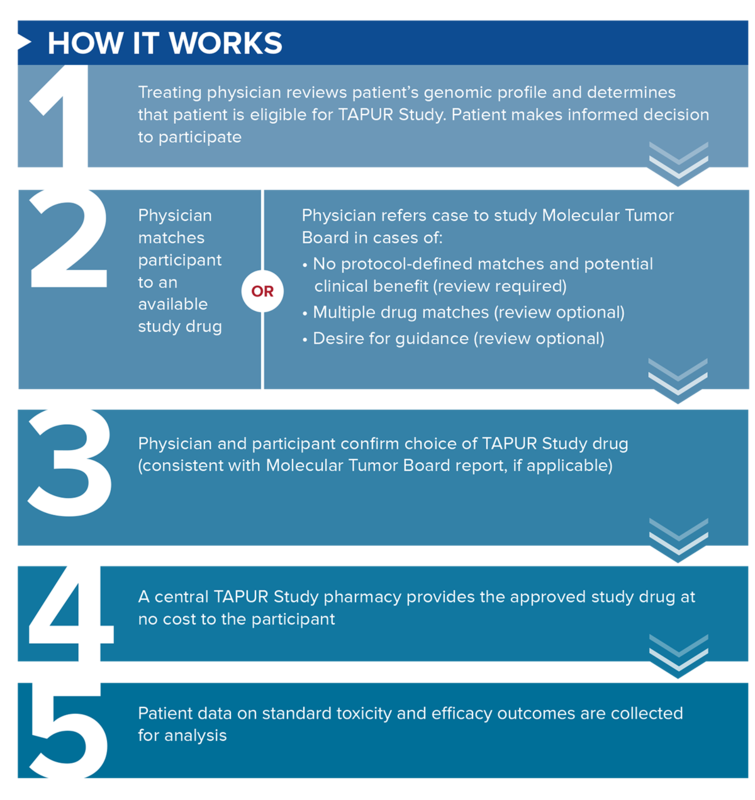 The TAPUR Study is open and enrolling patients at 113 clinical sites. Most of the clinical sites are part of a larger network, and all questions and/or referrals should be directed to the primary contact at the main operations center. For a list of available TAPUR Study drugs, see ClinicalTrials.gov: NCT02693535. Companies interested in more information or participating in the TAPUR Study may contact the TAPUR team. Eligible patients must have an advanced cancer with a potentially actionable genomic alteration that can be targeted with a TAPUR Study drug. The study requires testing in a lab that is certified under federal requirements (the Clinical Laboratory Improvement Amendments, or CLIA), accredited by New York State (for laboratories offering services to residents of New York), and accredited by the College of American Pathologists. Creates reports that specifically identify the TAPUR Study genes, which can be sent to TAPUR Study clinical centers. ​*If this condition is not met, additional restrictions apply. Laboratories interested in obtaining this designation may contact the TAPUR team. Disclaimer: Neither the American Society of Clinical Oncology, the TAPUR Study, nor any of their affiliates endorse, support, or oppose any particular product, service, organization, treatment option, or other matter. The mention of any product, service, organization, activity, or therapy on this website, or the designation of a laboratory’s reporting as being optimized for TAPUR reporting, should not be construed as an ASCO endorsement. View the latest study news, including links to press releases, information on study progress, and timely updates of interim cohort analyses and closures. If you meet the criteria listed above, you may qualify for the TAPUR study. We encourage you to speak with your doctor or contact the ASCO TAPUR team for more information.